His Navy are turning out far too long so…. put them on hold for a while. I may frog entirely rather than frog back to gusset. So…. 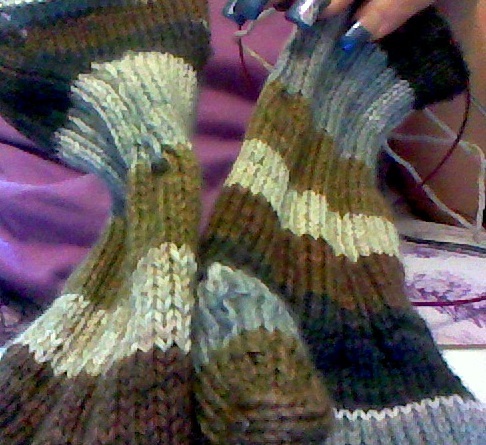 I started a pair of two at a time, toe up socks in Knit Picks Felici Sport in Sticks and Stones. Rather than do a more ‘traditional’ two at a time approach, I’m doing one on 4 dpns and one Magic Loop alternating working each sock with the completion of each color stripe. Why am I doing this insane method? (other than because …. well, nvm) I want to know which really works better/faster for me. The conclusion so far is that it depends on what part of the sock I’m on. The Felici Sport is a delight to work with – soft, soft, soft. I’m trying to keep a fairly tight tension for a sport yarn though so the socks aren’t too loose to be useful. There was a colorization problem with one yarn where a stripe didn’t match up but it was easily corrected. Knit Picks would have replaced it but I didn’t feel like waiting and it truly wasn’t a big deal. In the photo they aren’t held at equal height, they really do match up except an inch or so at the toe. The pattern is a conglomeration of several different patterns and seems to be turning out rather well! The cast on/toe was done with the cast on, knit a few rows then pick up side and ‘bottom’ stitches method. Then, I started a k2p2k4p2k2 rib an inch or two above the toe on the instep, added a p2 another couple of inches up the foot to add stretchiness over the wider part of his foot. The gusset is from Wendy Johnson’s Sportweight socks and I’ll do her heel as well. In non-knitting news… tomorrow afternoon I have another interview with a company I interviewed with over a month ago. We’ll see how it goes!